Inclement Weather Policy: Cancellations, delays of events, and closing of the Chamber office will be posted on ChamberECT.com, WBMW106.5 FM, JAMMIN’ 107.7 FM, Radio 104.1 FM, WICH-1310 AM, WCTY 97.7 FM, WNLC 98.7 FM, K-Hits– 100.9 FM, NBC 30, and News Channel 8. Learn how to gain the most value from your membership, and meet fellow new members in a casual atmosphere. 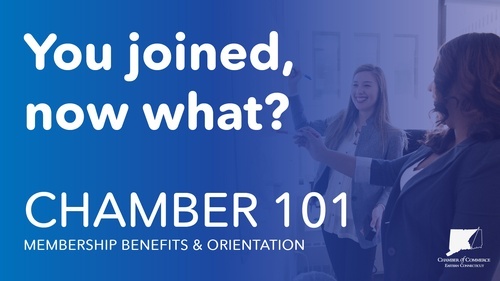 Our expert staff will walk you through the many benefits for your business, as well as the important role the Chamber plays in the local business community. Complimentary coffee and tea are provided. Guests are encouraged to bring lunch: click here for local restaurants we recommend. Space is limited - RSVP required. Cancelation Policy: If you have registered and can no longer attend, please advise the Chamber with as much notice as possible at info@chamberECT.com or (860) 701-9113.